Although we are still a month far, but it is never too late to get everything in place and be ready to give a perfect turnaround to the spring. 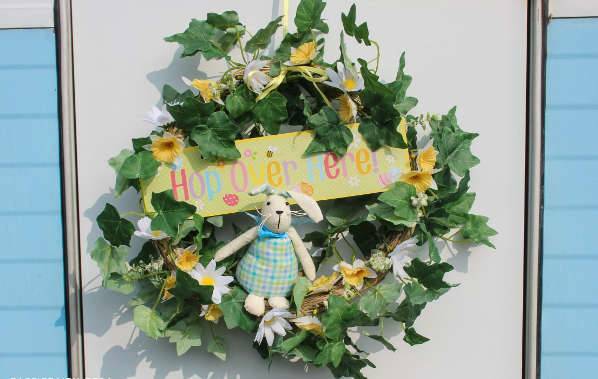 Moving over the winter snug and cozy, we are all set to add a bright touch to the indoors of your home with fresh flowers, cheery spring colors, and whimsical Easter-themed additions. 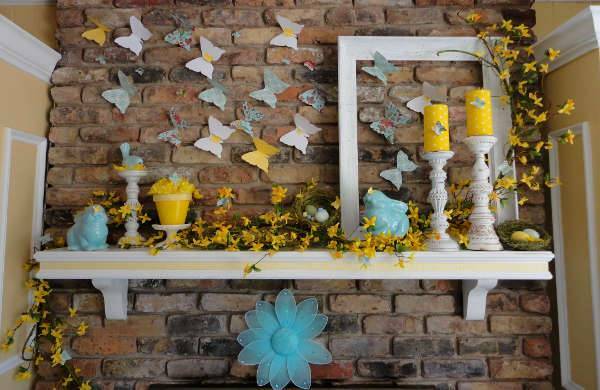 We have today come up with the 10 best Easter decorating ideas that are easy to accomplish and fun to look. Living wreaths provide an appealing touch to the indoors as well as outdoors. Instead of going for the artificial, try and use plants that represent spring and are also easy to take care. You can opt for succulents and moss for giving some life to your wreaths. The glittery eggs placed in a bed of moss make a lovely centerpiece. Use cardboard or blown-out eggs in soft pastel shades. Once the paint has dried, you can apply glue dots in a random pattern and then sprinkle some glitter over the eggs for a sparkling effect. The fireplace mantel is a great place to showcase the seasonal displays. It is also an attractive area to put the creamware collection by filling pitchers with fresh-cut greenery. 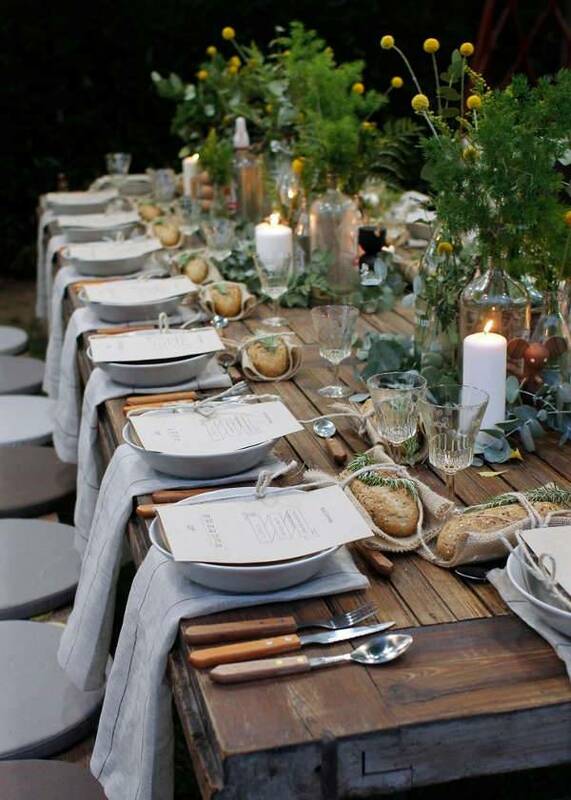 Pale green dyed eggs, wicker chargers, and small faux bird’s nests can further help to add an organic touch. 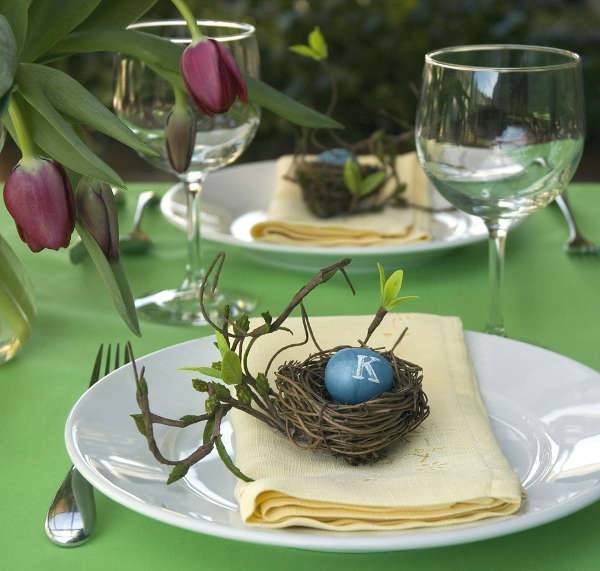 Bring the Easter to the outdoors with the help of some quick and easy centerpieces. 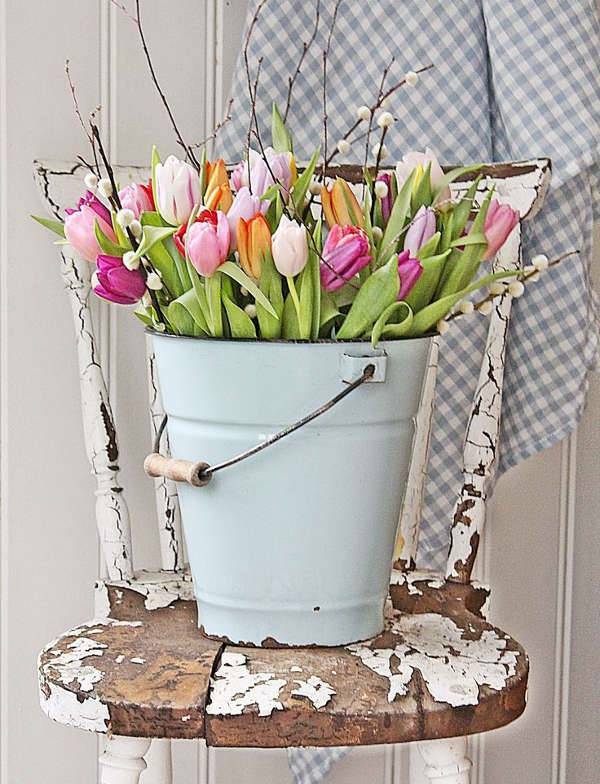 Pair the weathered watering cans, fill them with tulips and give a vintage and chic effect to your outdoor lawn. 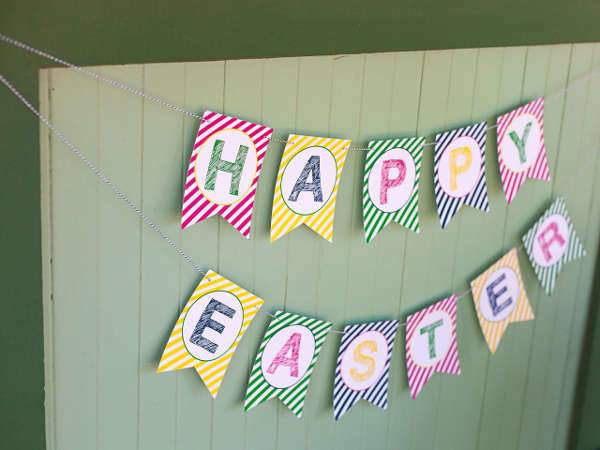 Welcome the family and friends to your Easter celebration with the help of a colorful banner. You can easily download the banner and cut it out in the needed shape and then glue them in a nice arrangement on the ribbon. Gold spray painted plastic eggs bring an antique look to the decorations. You can also customize the look further by pasting lettered stickers on the eggs. Fill the eggs with chocolate to include the decoration as a sweet party favor. Let the mother nature set the scene for the family’s easter brunch with a romantic setting. Add soft pastel colored tablecloths and plenty of fresh flowers and fruits for giving a citrusy effect to your Easter. 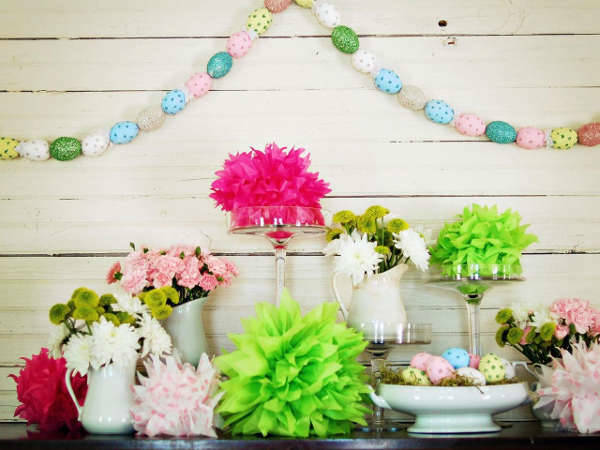 Blown-out pastel eggs can work as a great garland for Easter. Paint the eggs and string them together to create a colorful garland. 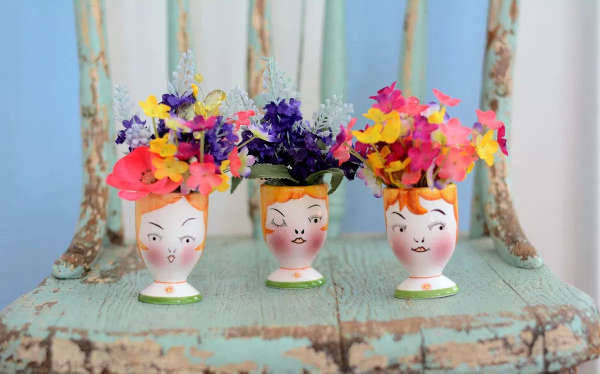 Make the ultimate, attractive centerpiece with the help of egg vases put together in the faux nesters. You can also make an Easter basket. 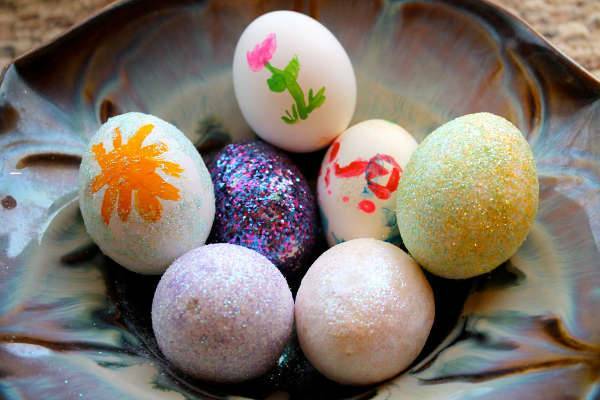 You can even color some of the eggs to bring in more color to the table. 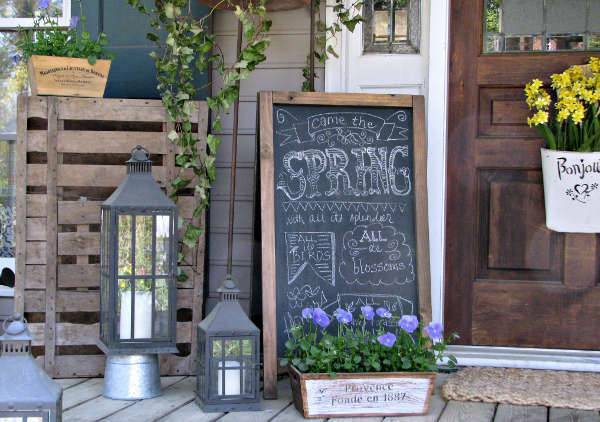 Add few pots filled with blooming plants to the front porch of your house. The plants will help to enhance the impact by investing little time, money and effort. Try and use black painted pots for bringing out the color of the plants further. Take inspiration from the above-mentioned design ideas and give your Easter a colorful twist to your home.